Liverpool goalkeeper Alisson showed his solidarity with opposite number Jordan Pickford after the final whistle of today’s Merseyside Derby. Pickford made a mess of things for Everton late on as he failed to deal with a looping ball that eventually fell to Divock Origi to bundle home the winner. Alisson consoles his opposite number Jordan Pickford after his error gifts #LFC victory in the Merseyside derby. 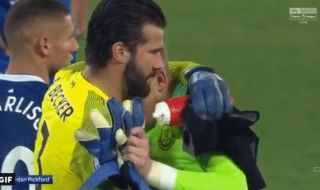 Alisson clearly knows how his opponent must be feeling, with this video clip below showing his class as he takes a moment to console the Toffees man. It wasn’t a classic derby at Anfield today, but that finish was as thrilling as anything we’ve seen in the Premier League this season.